There is a popular advertisement on TV. A child is running and falls down in the mud. His mother comes running, picks up the child, dusts his clothes and says: "Beta, get up. Don't worry, Surf Excel hai naa!" In a country where nearly three lakh farmers have committed suicide, farm incomes are plummeting, where rural infrastructure is in shambles, middlemen rule the roost, and there is jobless growth, FDI in retail is being promoted as yet another Surf Excel. An impression is being created that once FDI in retail is in place, it will not only address all the ills plaguing the food and agriculture sector, but also take care of employment. In the mid-1980s, when Pepsico came up with a proposal to bring in a second horticultural revolution in Punjab, it too was hailed as a path-breaking initiative that would put an end to the continuing distress on the farm. It was expected to usher in the latest technology, improve farm research and extension, create supply-chain infrastructure, and provide marketing linkages from farm to the fork. I remember the kind of excitement that prevailed all around. Politicians, bureaucrats, economists, agricultural scientists and even the Bhartiya Kisan Union (BKU) joined the chorus. Some 15 years after the project was approved, Pepsico's horticultural revolution is all but forgotten today. Agriculture has gone from bad to worse. The food bowl of the country has also become a major hot spot for farmer suicides. Arvind Kejriwal's scrapping of FDI in retail in Delhi has renewed the debate over one of the most contentious of policy issues. Commerce Minister Anand Sharma has expressed displeasure saying that the Delhi government's decision will send a wrong signal to foreign investors. On the other hand, FDI in retail will lay out back end infrastructure, bring in a chain of cold storages and improved transportation thereby reducing crop losses, remove middlemen who rob the farmers of profits, and thereby provide him higher prices and bring in improved technology to help in crop diversification. Of course, it will also create millions of jobs. Let us now examine how true these claims are, or at least how likely. Wal-Mart, Tesco, Sainsbury, Carrefour and a host of other big retail players are expected to increase farm incomes. But in the US, where Wal-Mart has completed 50 years, if farmers had indeed been getting better income, what reason would there have been for the farming population to plummet to less than one per cent of the total population? In the US too, 40 per cent of food is wasted and much of it after processing, where Wal-Marts should in fact have played a more important role. If big retail failed to reduce food wastage in the US, why do we expect them to do a miracle in India?  A stimulus package for farmers? Farmers in US survive on the farm not because of Wal-Mart but the massive subsidy support they get, which includes direct farm income. Between 1997 and 2008, Rs 12.60 lakh crore was provided as income support to farmers. An UNCTAD-India study shows that if these subsidies, classified as Green Box in WTO parlance, are removed, American agriculture will collapse. In Europe, despite the dominance of big retail, one farmer quits agriculture every minute. Europe provides the highest amount of subsidies, including direct income support. But because 74 per cent of these subsidies are cornered by Corporations and big farmers, small farmers are quitting the sector. In France, farm income has come down by 39 per cent in 2009. In OECD, the richest trading block comprising 30 countries, Rs 14 lakh crore was the farm subsidy support in 2009 alone. It is not big retail, but direct income support that keeps farmers in agriculture. Studies show that in America, some 50 years back when farmers sold their produce for one dollar, their income was 70 cents. In 2005, this had fallen to 4 per cent. With middlemen wiped out, one would have expected the farmer's income to go up. But now it is a new battery of middlemen . quality controller, standardiser, certification agency, processor etc - who walk away with the farmer's profits. The number of middlemen, operating under the same hub, actually increases. Take the example of an earlier Walmart-Bharti tie-up for wholesale marketing in Punjab. Baby corn is bought by Bharti-Walmart at Rs 8 per kg, sold at Rs 100/kg in wholesale by big retail, and ultimately the consumer price hovers around Rs 200/kg. It's a clear example of how the middlemen squeezes farm incomes and fleeces the consumers. This is not an isolated case. 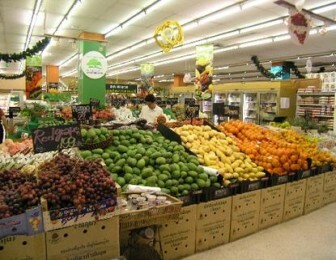 Much of the farm produce is bought at very low prices across the globe. Primarily for this reason, dairy farmers in UK are quitting on a large scale. They are urging the British government to set up a fair price mechanism that big retail should be directed to adopt. There is no evidence that big retail creates back end infrastructure either. In US and Europe, rural infrastructure has been created through government support which came in the form of agricultural subsidies again. To say that 40 per cent of agricultural food that goes to waste in India will be drastically reduced by the influx of FDI in retail is also an illusion. In US too, 40 per cent of food is wasted and much of it after processing, where Wal-Marts should in fact have played a much more important role. More than 50 per cent of vegetables/fruits rot in supermarket stores. If big retail failed to reduce food wastage in the US, I wonder why do we expect them to do a miracle in India? Regarding employment generation and poverty alleviation, lessons need to be drawn from a 2004 study by Stephen Goetz and Hema Swaminathan of Pennsylvania State University, which showed how higher poverty prevailed in areas where Wal-Mart stores had come up, compared to those states where big retail was absent. In any case, in a market with a turnover of $450 billion, Wal-Mart employs only 2.1 million people. In contrast, for an estimated $460-billion market, Indian retail employs 44 million people. If Wal-Mart is allowed to come in, what has to be understood is that for every job it creates, it is most likely to displace at least 20 workers. Yes, there is a need to improve rural infrastructure, provide a sophisticated supply chain, and provide better income to farmers. The milkman of India, late Dr Verghese Kurien, had shown us the way. The cooperative dairy structure, which led to the evolution of the Amul brand, is the right approach. If he could do it for milk, which is a highly perishable commodity, there is no reason why it cannot be replicated for fruits, vegetables and other agricultural commodities. A solution to the plethora of problems on Indian farms does not lie in the west, but in our own backyard. There is no need to look for a Surf Excel. Devinder Sharma is a food and trade policy analyst and chairs the New Delhi-based Forum for Biotechnology & Food Security. His blog, Ground Reality can be read at http://devinder-sharma.blogspot.com/.